D- Rex Interactive Dinosaur brings a glimpse of the future for dinosaur toys, indeed of all animated or interactive toys to us now. 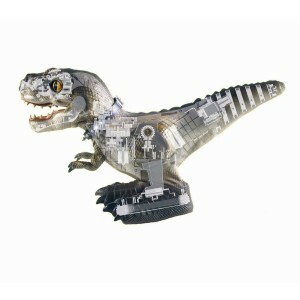 The D-Rex is not just another battery operated toy. 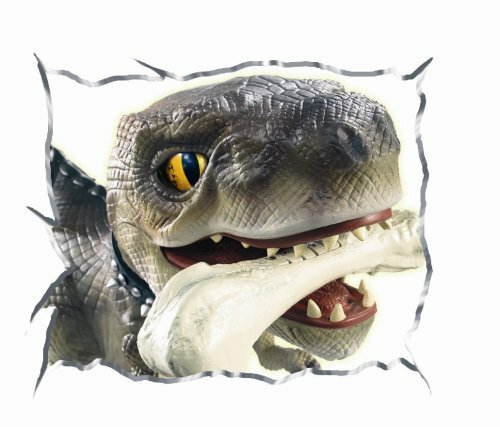 This interactive dinosaur combines robotics and a proprietary built-in software with lifelike reptilian skin to create a dinosaur toy that mimics lifelike intelligent behavior. This t-rex is a virtual pet dinosaur of the poop-less pet genre. Modeled after the ever popular t rex this dinosaur requires training just like a real pet and just like a real pet he sometimes has a mind of his own. Rex is now a collectors item. I don’t know why toy companies like Mattel discontinue popular toys but they do. Who Should Buy The D-Rex Interactive Dinosaur? This is a great dinosaur toy designed to stimulate the imagination and allow a child to fantasize while engaging in active play. But it is not for very young children. 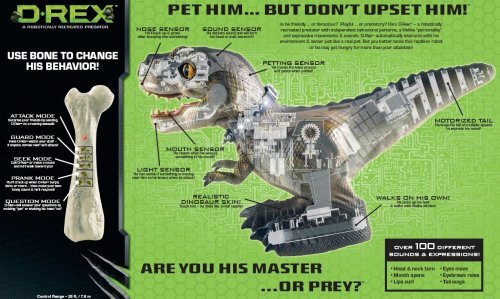 Mattel recommends the D-Rex for ages 8 through 18. Both D-Rex and Cruncher have collars but with the D-Rex Dinosaur it is just for looks. D- Rex steps things up a notch by adding a remote controller to the equation instead of pushing buttons on a collar. Cruncher is a straight forward little dinosaur while Rex the Dinosaur is all over the place with a mind of his own. Young children will probably have a difficult time training and controlling this dinosaur toy and may become frustrated. Kids all mature at different rates and you are the best judge of whether your child is ready for this toy. Although this toy is sturdy and well-built it has its limitations and your child must be responsible enough to care for it properly. Because of the sophisticated electronics inside D-Rex he should not be allowed to get wet. Taking a bath is not a trick you want to teach Rex. 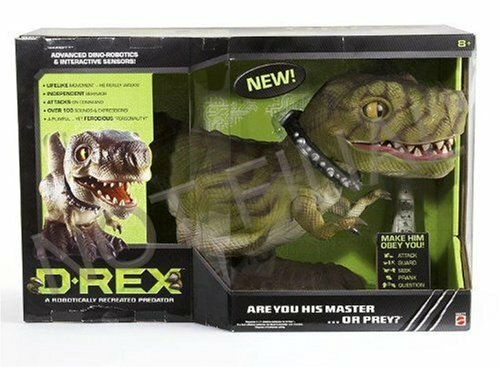 D-Rex is capable of doing many different things and training him can take some patience but this dinosaur toy appeals to a broad age range and will keep them occupied teaching new behavior patterns for quite some time. 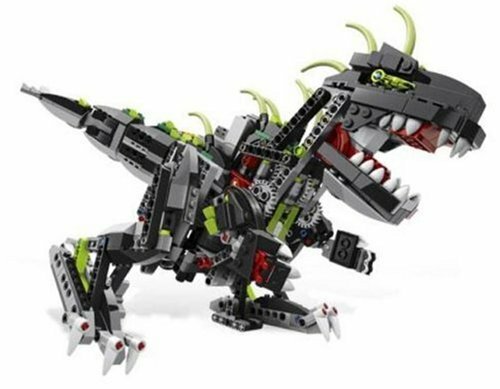 If your child is younger be prepared to spend some time helping them to master this dinosaur. If your child is not ready for D-Rex yet then Cruncher is a good alternative and you can read my review of the Cruncher Interactive Dinosaur or you can find him on Amazon here. As soon as you take this robotic dinosaur from the box you will realize this is no ordinary dinosaur toy. Rex’s skin really looks and feels like real reptile skin and is fitted so that it wrinkles when he moves. This alone makes him feel and look more authentic than other dinosaur toys. He has an on/off switch, a battery LED, and an array of sensors, one for his petting responses in back of his head and another in his nose that makes him aggressive and makes him back up if he walks into something. In addition he has a sensor in his mouth that makes him chew and light and sound sensors so he can react to movement and come when called. 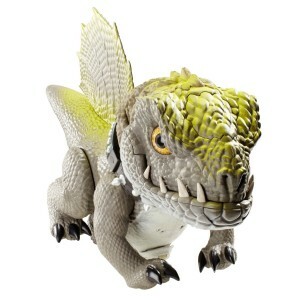 D-Rex comes with a bone shaped controller that can activate 5 different behaviors and is powered by two AAA batteries. The 5 C batteries go into the tail and you will need a Phillips head screwdriver to install them. Rex comes with a battery saving sleep mode. After 30 minutes of no interaction he will shut down and take a nap. To wake him simply press his nose. Rex the Dinosaur can respond to voice commands and to touch. If you call him he will come and if you scratch the back of his head he will let out an appreciative roar. Putting something in his mouth will trigger a sensor and he will start chomping on it. The controller can activate five different modes of behavior. Prank mode for example you can make him burp or fart. Question mode he nods yes or no to answer questions. The D-Rex Interactive Dinosaur offers kids a toy that can be trained yet is independent. They need to work with it and learn how it reacts and how to train it much like a real pet. It fosters fantasy and imagination and offers enough variables they are not likely to tire of it easily. Bear in mind some product reviews are over three years old and with the original model. Since that time the D-Rex Interactive Dinosaur has been upgraded and the price has come down. Lets be realistic here. Although billed as a prehistoric pet it is just a sophisticated toy . Robotics have a long way to go before they can replace a living breathing pet. I wonder how many of these folks actually took the time to learn Rex’s ins and outs. Some people reported their children got bored with it. Every child is different. Toy companies are in business because kids want new toys. Some will get bored with Rex and others will make him their favorite toy. Children are often unpredictable and there is no guarantee the novelty of any toy wont wear off. The one negative we found is that the D-Rex Interactive Dinosaur should have a built-in charger so it is unnecessary to change batteries.